Spades is a very popular card game. 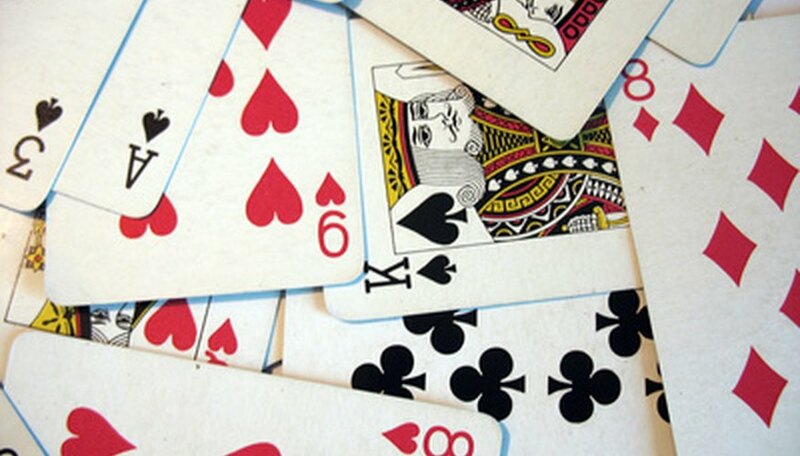 Many people use spades as a stepping stone game that teaches trick taking and bidding concepts to players before teaching them how to play games such as pinnochle, euchre, or bridge. The concept when playing Spades with three people is that each player scores points for themselves, instead of with a partner. Each player makes a bid, and then plays to the tricks in the hand. Players are rewarded for making correct bids. Players are penalized heavily for overestimating the number of tricks they will take, and penalized to a lesser extent for underestimating their bids. Find two other people to play the game of Spades with. For a game of Spades with three people, each player will have an individual score. There are no partnerships in Spades with three people. A full deck of cards is used in a game of Spades with three players. Deal seventeen cards face down to each player at the table. There will be one card that is not dealt to anybody at the table. This card is discarded without any player seeing that card. Start the bidding round. Each player now gets to bid how many tricks he or she will take. A trick is having the highest card of the three cards played in a round of cards of the suit led when each player plays one card. There will be seventeen tricks played in each hand of Spades with three players. Make sure all players know that spades are trump; this means if a player doesn't have a card in the suit that was led, he or she can play a spade. If a spade is played to a trick, the highest spade played wins instead of the suit led. Write down each player's bid. Explain to each player that they will get 10 times their bid if they takes at least the number of tricks they bid. If a player takes fewer tricks than he or she bid, he or she receives a negative score of the number of tricks he or she bid times ten for that round. Lead the two of clubs for the first trick. The player with the two of clubs must lead it to start the game. If no player has the two of clubs, the three of clubs must be led. Players must play a card from the suit that was led, unless they do not have any cards of that suit. If a player is out of cards in the suit that was led, he or she may play any other card, including a spade. Remember, the highest spade played to a trick wins the trick, even if spades were not led. The winner of the previous trick leads a card to start the next trick. Spades can not be led until one is played to another trick. Continue playing in this manner, until all seventeen tricks have been played in Spades for three players. Count the number of tricks each player scored. If a player won the exact number of tricks he or she bid, he receives a score of 10 times his or her bid for that round. If a player takes more than the number of tricks he or she bid, he receives a positive score of 10 times the bid he or she made, less ten points for every trick over that amount. As an example if a player bid seven tricks and wins seven tricks, he or she scores 70 points that round. If a player bid seven tricks and wins eight tricks, he or she receives 60 points which is ten times his or her bid, less the 10 point penalty for the additional trick over his or her bid. If a player wins fewer tricks than he or she bid, he or she receives a negative score of 10 times his or her bid for that round. Add any positive scores for the round for each player's total score, and deduct any negative scores from the round from the total score of the player who received a negative score in the round. Continue playing until one player reaches an agreed winning score. Typically this is 500 points. If two players pass 500 points on the same round, the player with the higher total score wins. There is no bidding "Nil," which is bidding that a player will take 0 tricks in a round in Spades for three players. There also is no Double Nil bids or Blind Nil bids in Spades for three players. A player must play a card from his or her hand of the suit lead whenever possible. If it is found out that a player played another suit when he or she had a card of the suit led, a penalty is assessed to that player. The typical penalty is a negative score of twenty times the number of tricks bid.